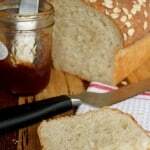 This is an easy sourdough bread recipe using your natural sourdough starter. 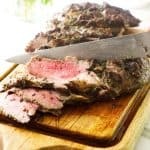 This can be baked in a dutch oven or on a sheet pan for equally great results. Sourdough bread recipes tend to look intimidating and complicated. 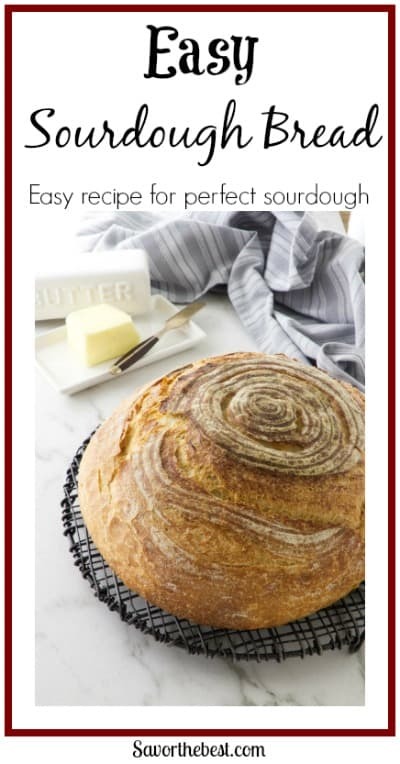 If you look at most sourdough bread recipes, they are long and have several steps to them. Additionally, for anyone that is new to baking sourdough, most recipes use unfamiliar terminology. Truly, you don’t need to know the difference between a poolish, levain, mother, or sponge to make great sourdough bread. And you don’t need to take all the extra steps to be successful. A condensed version of all the steps can be broken down into five basic actions. Mix all the ingredients together and knead the dough. Let the dough rise a second time. Bake the loaf of bread. It is really that easy. The instructions in the recipe card are lengthier in order to give you more success but all you have to do is start. The more you bake bread, the more proficient you will get. 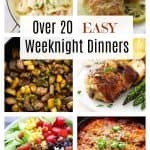 You will even find yourself checking out long, complicated recipes. Bread making is an addicting hobby. Kneading dough helps form the gluten and gives the bread strength, structure, and better texture. With most bread recipes, in order to get the gluten to develop completely, you will have to knead the dough for 10 minutes or longer. However, another way that gluten is formed is to allow the enzymes in the flour to break down the proteins and develop the gluten. In other words, letting the dough sit for an extended period of time will naturally “knead” the bread. Since natural wild yeast works slower than commercial yeast, the longer ferment time will do most of the kneading for you. As a result, this recipe does not require a long knead time. If you find it therapeutic then go ahead and knead the dough. But if you’re anxious to move on to your next chore then you only need to work the dough for a minute. 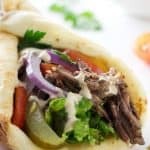 Is it necessary for the bread to rise twice? Almost every yeast bread recipe instructs you to let the bread go through two rise sessions. Mix it, knead it and let it rise once. Then knock the air out, shape the loaf and let it rise a second time. If you’re new to bread making, you may want to skip that second rise and bake it right after the first rise. If you really want to skip the second rise, you can. You will still have a reasonably decent loaf of bread. However, if you want exceptional sourdough bread, then yes, allow the bread to rise a second time. The second rise does all kinds of magic to the bread. It gives it a much nicer texture and allows more flavors to develop, giving it a rich and malty flavor. If you have ever made yeast bread and forgotten the salt, you will understand when I say it will need to be relegated to the compost bin. Perhaps you could use it to make seasoned croutons. But, honestly, bread made without salt is quite bland and tasteless. Most yeast bread recipes will instruct you to add the salt just before the second rise. The reason many recipes have you add salt later is that salt will kill the yeast. With that said, this recipe (as with most yeast bread recipes) is only 2 percent salt. Truthfully, that is not enough salt to kill your yeast. So go ahead and add the salt in the beginning. The bread will rise just fine. Since natural sourdough takes longer to rise, it can lose its shape over time. 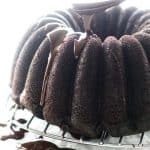 By placing it in a proofing basket or bowl, it will hold its shape and prevent the dough from spreading out and becoming flat. You can also help the dough hold its shape better by creating a tightly formed ball of dough. If you cup your hands around the ball of dough then drag it toward you, the dough will start to tighten. Turn the ball of dough and repeat that step three to four times and you will see that the surface tension improves. 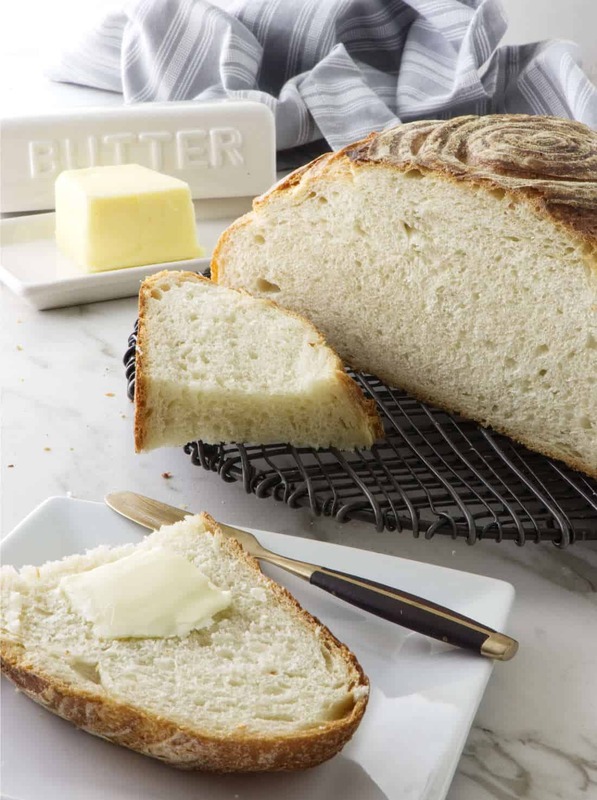 Watch our video to see how we shape the bread to increase surface tension. There are several things you can use to hold the shape of your bread while it proofs. If you don’t have a proofing basket, a colander or pyrex bowl works well. If you use a colander, place a tea towel in it so the dough does not fall through the holes. Flour the towel very well to prevent the dough from sticking to the towel. Plain flour will absorb moisture over time so we recommend using a mixture of rice flour and all-purpose flour. Make a blend with equal amounts of flour for perfect results. If you want to use a bread proofing basket like this Brotform, you will not only end up with a nicely shaped loaf but the basket will leave a lovely impression on the dough. It makes a beautiful loaf of bread. As with the tea towel, you will need to give it a generous dusting of flour. Make a 50/50 blend of rice flour and all-purpose flour. If you only use all-purpose flour to dust the Brotform, the dough will stick to the Brotform when you try to remove it. You can even use a mixing bowl to hold the shape of your dough. 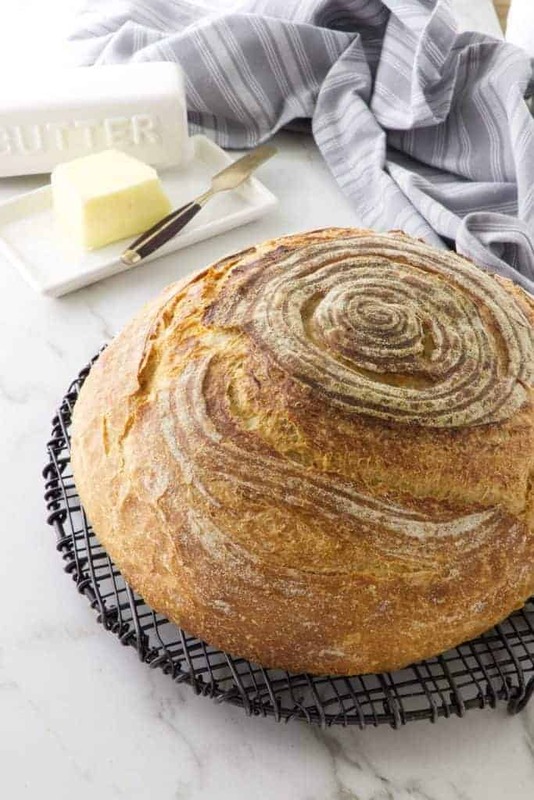 Just find a bowl the size and shape that you would like your bread to be shaped. It does not need to be an oven-proof bowl because you will not bake the bread in the bowl. Give the bowl a generous spray of oil and plop the dough into the bowl. Once your bread has risen a second time you will tip it out of the bowl or basket and into a Dutch oven. If you don’t have a Dutch oven, you can tip it directly onto a baking sheet. You will get a nicer crust if you use a Dutch oven but you will still have great bread if you don’t use one. John 6:35 Then Jesus declared, ‘I am the bread of life. Whoever comes to me will never go hungry, and whoever believes in me will never be thirsty’. Combine all the ingredients in the bowl and stir until it is a chunky, loosely combined dough. Dump the dough onto a work surface and knead the dough with your hands until the dough is smooth. (Essentially, you are massaging the dough by stretching and pushing. This will help develop the gluten.) At this stage, it will be wet and sticky. 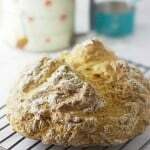 Don’t add more flour or your finished bread will be dense and heavy. The dough will stick to your hands and feel messy but if you get your hands wet it won't stick as easily. Pre-heat the oven to 450°F. When the oven is hot, tip the loaf of bread into a dutch oven or onto a baking sheet. 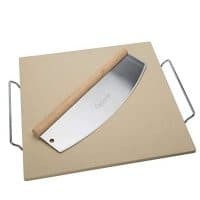 Make a slash in the loaf with a sharp knife. Bake for 45 to 50 minutes. The amount of time needed for your bread to rise will vary depending on the temperature and humidity. You can slow the rise by placing it in the refrigerator and speed the rise by placing it in a warm room or a dehydrator. A slower fermentation time will help develop more complex flavors. You will have more accurate measurements (and better results) if you weigh your ingredients with a scale. When you knead and shape your dough, try not to add any flour to your countertop. Adding additional flour will create a denser and heavier bread. You can prevent the dough from sticking to your hands by getting your hands wet. 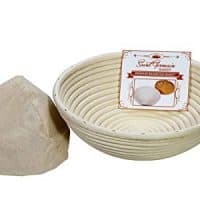 If you use a Brotform proofing basket or a tea towel in a bowl to shape your dough, give the basket or tea towel a very generous dusting of flour. Regular flour will absorb too much of the moisture and make the dough stick to the brotform. We recommend making a 50/50 blend of rice flour and all-purpose flour to dust your Brotform or tea towel. A Dutch oven works very nicely to form a crusty bread but if you don't have one you can just bake the bread directly on a baking sheet or even on a hot pizza stone. 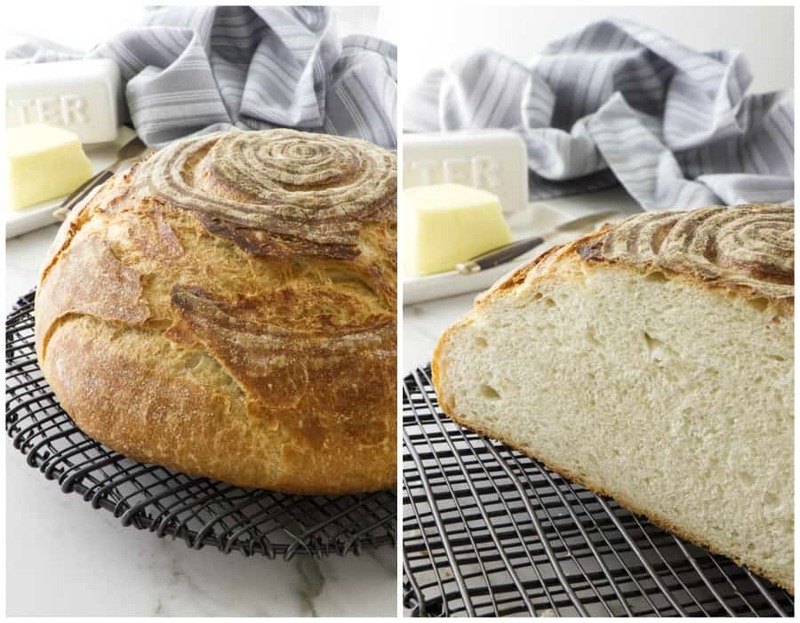 Have you made this easy sourdough bread recipe? We would love to hear from you. We would also love to see a picture. Tag us on Instagram. This recipe did NOT work for me. My starter was definitely ready. I’ve been feeding it 2x per day for 12 hours for two weeks and it doubles in volume consistently and is frothy and bubbly throughout. I think there is something off with either the instructions on knead time or the first rise in the refrigerator. Either way, my dough barely rose at all in the refrigerator even after 12 hours. The second rise I did at room temp and the loaf rose a little bit but it was obvious something was not right. I ended up with a dense, inedible loaf. Really discouraging first attempt at making sourdough bread at home. Marguerite, there are so many variables in bread baking that it is difficult to know exactly what went wrong this time. If this was your first attempt don’t be discouraged. Bread making, and especially sourdough bread, is more than simple science, it is also an art and skill. Over time you even develop an intuition. It definitely takes some practice. It sounds like you may have needed to let the bread rise longer. You will find that bread rises much faster in the summer and slower in the winter. Rainy days will even affect how bread rises. Another possible factor could be how you measure your ingredients. If you weigh your ingredients you will have much more success. Often times, if you use a measuring cup it is easy to almost double the amount of flour that the recipe calls for which would mean that there is not enough starter for the amount of flour and that would prevent the bread from rising enough. It is hard to know what did not work for you without being in the kitchen with you but I hope you keep trying. 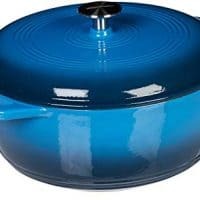 Should the dutch oven be preheated in the oven? Another recipe I saw, asked for the dutch oven to be scalding hot when the dough was put in. John, you will definitely get a higher rising bread and a crustier crust if you pre-heat the dutch oven but it is an optional step. The bread bakes very nicely if you do not have a Dutch oven or if you do not pre-heat it. 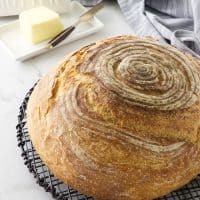 It can be a little daunting for some people to lower the bread dough into a hot Dutch oven so this recipe shows that you can get a lovely loaf of bread without pre-heating the Dutch oven. When I pre-heat my Dutch oven, the bread rises about 1/2 inch higher. If you want your bread to rise to its highest potential and don’t mind dealing with a hot Dutch oven then pre-heat the D.O. for 30 minutes before lowering the risen dough into it. How much rise should I expect from the first rise? AKA – How will I know if it’s time to shape it? Hey Stephanie, the dough will rise about 1-1/2 to 2 times its original size. If you let it rise overnight in the fridge it may not even rise that much but it will be good to shape and let rise again for the loaf. Wonder if this would work using sprouted flour? I love the refrigerator rise idea. 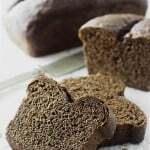 Yes, Kathy it absolutely does work with sprouted flour and makes wonderful bread! Enjoy!! Really good bread baking primer. We aren’t eating as much bread as we used to, so haven’t baked any for quite some time. Probably time to start again, though — nothing like the flavor of your own bread, is there? Terrific post — thanks so much. Thanks, John, your so right. Home-baked bread just cannot be beat!